Ladies and gentlemen, meet bellwire. They are: Mike Holland (Guitar), Chris Faulkner (Drums), Tyler Burdwood (Guitar/Vocals), Jack Holland (Bass), Natalie Kovalcik (Miscellaneous, incl. “ghost vocalist”) and Sam Rheaume (Miscellaneous, incl. 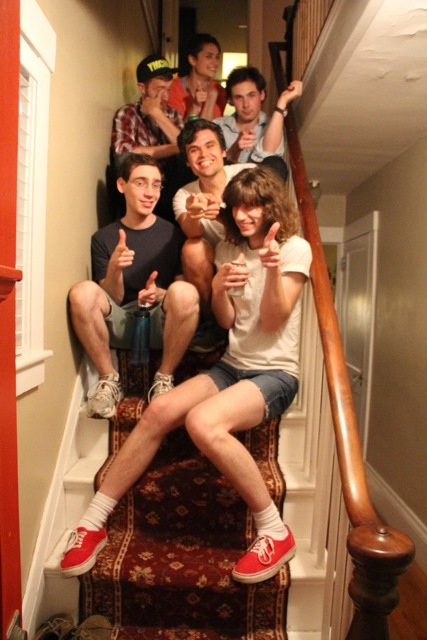 “ghost vocalist”), and they are collectively from various parts of coastal New Hampshire. They’ve all recently graduated from college and will soon be headed down to Allston, Massachusetts to make more music. All I can add is that I wish I could have had their tunes to listen to back when I had to try and get pine tar out of my ruffles on a regular basis. There are only three songs on the ep; I have picked one to share – Leaky Seams – because it is both the shortest and the most lyrically dense, and also because it is possibly the most upbeat song I have ever heard about watching horror movies in the back yard. Tagged bellwire, rock 'n' roll photog, tomboy rock.